A little break from all the Art Basel stuff. There's more coming but I have a few new things I wanted to share and I couldn't wait until the end of the fair. The new Burial album is on repeat at home and it seems burning a hole in people's pockets (the album is the number seller at NYC's OtherMusic). I'm glad to see the current UK obsession of dubstep and two step making a dent in the indie music scene. It is far from being accepted for regular play at bars and Lounges except at the most eclectic of venues (it is not really dance music, but I guess you can dance to anything) but does not mean you should not crank it up at home or on your headphones (speaking of which I had another pair die on me yesterday...). In fact he suggests it is music for walking home to after a long night out. A way to escape real life. Burial is a mystery to most. Even to his family. He doesn't DJ, doesn't perform, doesn't grant interviews, doesn't take photos (those photos that exists are edited to hide his identity). In fact, "Only about five people outside of my family know I make tunes, I think. I hope," he says. Some might strike a similarity between Daft Punk hiding behind masks and Burial. But it is much different. Daft Punk was a statement of sorts, Burial honestly does not want anyone to know who he is. "I like it that way. I've had times when I've had mates sitting next to me and they've put my tunes on without knowing. I would just sit there whispering to myself, 'Please don't put that on - or at least, don't say anything bad about it. I've had someone say to me, 'Yeah, Burial's a girl. I know someone who met her.'" He explains that he likes the mystery because he feels it helps the listener enjoy the music more. He references it back to a time when you would go to a club and hear a garage or jungle tune and not know a single thing about artist, so it is just you and the music. I'm not a huge fan of Bloc Party, but this mix seems like a B-Side to Untrue. Untrue is out now on Hyperdub Records. 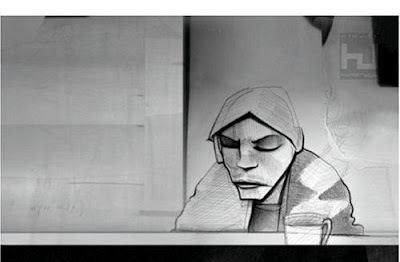 Oh the artwork for the album is a sketch by Burial himself that he has been drawing since he was a boy, "Just some moody kid with a cup of tea sitting at the 24 hour stand in the rain in the middle of the night when you are coming back from somewhere." Quotes taken from the Guardian Unlimited article by Dan Hancox and internal Hyperdub interview. I usualy don't say this... but great post! I dicovered Burial last year in the film "Children of Men". The soundtrack just stuck and I had to buy the album. his debut last year was also great!